THREE past and present international rugby stars made a special visit to Droitwich last Sunday to help inspire hundreds of promising young players. More than 250 youngsters turned out at Droitwich Rugby Club to meet England flanker Tom Croft and former Leicester Tigers aces Geordan Murphy and Leon Lloyd. The special day, which was organised by Nicol & Co Estate Agents, saw the trio talk to each of the club’s age groups, which range from u6s to u17s, and answer a series of questions. 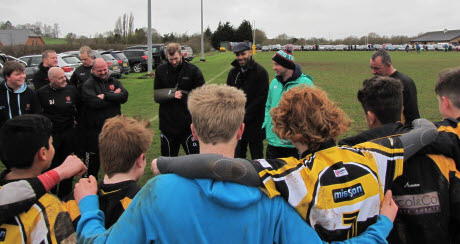 Director of rugby Duncan Hughes said: “I have to give them credit because the weather on Sunday was disgusting, but they stood out in it and were quite inspirational to a lot of the boys who asked some really good questions. “They were with each age group for about 20 minutes which gave our boys a chance to have a chat with them and ask them about their experiences in rugby.